Videoconferences and TelePresence meetings are now part of everyday business for many companies. Consequently, there are already many good solutions available with regard to the required hardware. Yet, it is often not considered or even underestimated, that the management and booking of videoconferences involves considerable efforts as well. One of the greatest challenges that has to be met, is the parallelism of several processes. The booking steps of the videoconference, including rooms and resources, are usually not interlocked, which leads to an immense expenditure of time. The consequences are error sources and long lead times, which can ultimately result in low utilisation degrees. raum]für[raum offers an intelligent solution with its additional modules, to organise videoconferences in their entirety. The relevant processes all derive from a single software. The term “Videoconference” refers to a visual communication with image and sound, which is transferred across two or more locations live and in real-time. TelePresence conferences also offer real-time communication and the exchange of images and sound. In contrast to regular videoconferences, however, this is carried out with much higher bandwidth and full HD resolution. Unified Communications (UC) combines several communication technologies into one functioning system. Thus, the administration of communication media or end devices is simplified, which increases and improves the availability of the communicating parties. The global market leader Cisco provides two management systems in its diversified videoconference and TelePresence offerings: the TelePresence Management Suite (TMS). These can be connected bi-directionally with raum]für[raum in order to plan and execute videoconferences optimally. Multitenancy is of great importance in many platform concepts, whether it is for complex corporate structures or Managed Services. But since Cisco’s TMS is not multitenant, solutions are often hard to realise. raum]für[raum as central management software offers a great advantage here, because the operative functions as well as the technical settings are available as multitenant system. The integration of worldwide locations is obligatory in the operation of large systems. In this context raum]für[raum supports the operator as well as the individual user, because different time zones are displayed reliably and transparently during the booking process or the modification of a videoconference. External locations and participants can easily be integrated in a videoconference booking. The users have the possibility to activate this option during the booking process. The selected locations and participants receive an automatic e-mail or a calendar entry with the required conference data by raum]für[raum. The connection to a groupware system extends the functions of your booking software enormously. The users choose the desired participants in the course of the booking process from their address books. raum]für[raum sends automatic e-mails with information about the videoconference meeting to the selected persons. If the invitation is accepted, the meeting is also directly entered in the calendar of the participant. raum]für[raum supports many different display types, which reliably show your current videoconference information. The layouts can be created individually, so that the desired information is presented exactly as you wish. Which occupancy rates were registered in the last quarter? How often have the videoconference objects been used? How many conferences took place at a certain location? What kind of costs were caused on which cost unit? The reporting function of raum]für[raum provides you with transparent answers. Invoices and pricing are important topics for many videoconference platforms. Depending on the operating concept, various pricing models can be applied, such as lump sums, time-dependent or time period models. Since the requirements in this area can be very differentiated, raum]für[raum offers a wide range of configuration possibilities. You entered the valid pricing models for the operation of your platform in raum]für[raum. This is the basis for every invoice you want to create with the software. 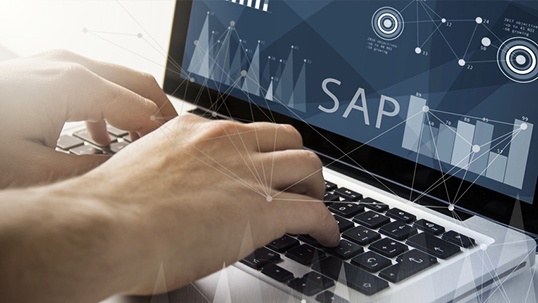 The connection to SAP allows a specific processing of your data to prepare it for the export in the modules CO and FI. You can find further information under "Modules"